When you need good, solid diner food, Phill Hughes of Phill’s Diner is the man to see. And with breakfast served until 2 p.m., you have plenty of time to make it in for a stick-to-your-ribs meal. Staples like three-egg omelettes, hot cakes, city and country ham, waffles and chicken-fried steak are available alongside weekday and weekend specials. The $6.63 Specials are posted on a chalkboard everyday with off-menu customer favorites. Why such an odd price for a special you may wonder? Because with a cup of coffee and tax, the meal totals $9 even. If you are having a hard time deciding what to order, go with Phill’s favorite: made from scratch corned beef hash (it’s fantastic). 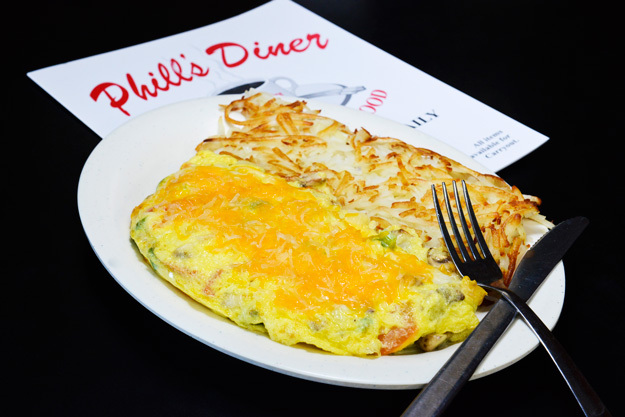 Find Phill’s Diner at 3310 E. 32nd St., Tulsa.